Inside the Hotel Bel Air Spa, I met fascinating urban beekeeper Paul Hekimian during a Valmont beauty event. Valmont has been a pioneer in the world of luxury cosmetics for over 30 years. The Swiss skin care company draws inspiration from the latest scientific research to restore and repair skin. 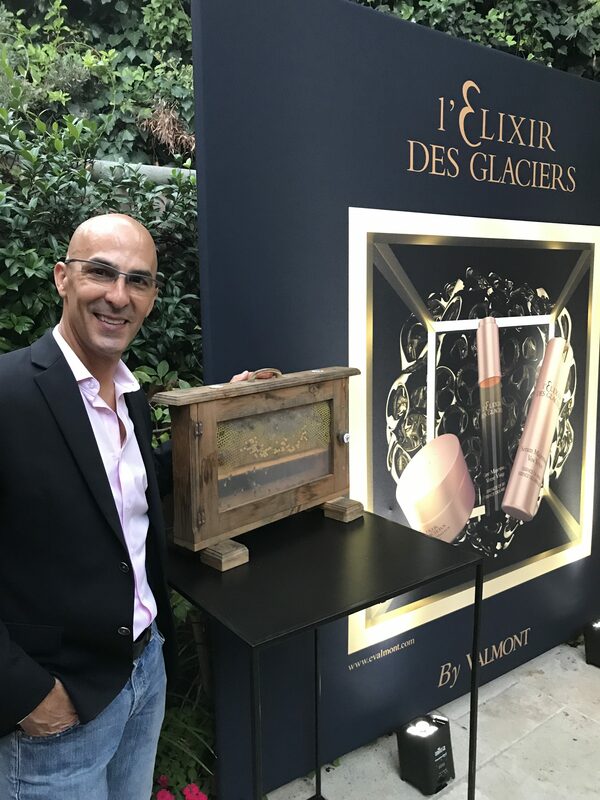 In addition to using Switzerland’s pure natural resources, including glacial spring water and essential plant extracts grown in Valmont’s own conservatory in the Swiss Alps, they are now using beneficial ingredients made from bees. Hekimian is the Director of HoneyLove, an organization with a mission to protect the honeybees by educating communities and inspiring people to be urban beekeepers. 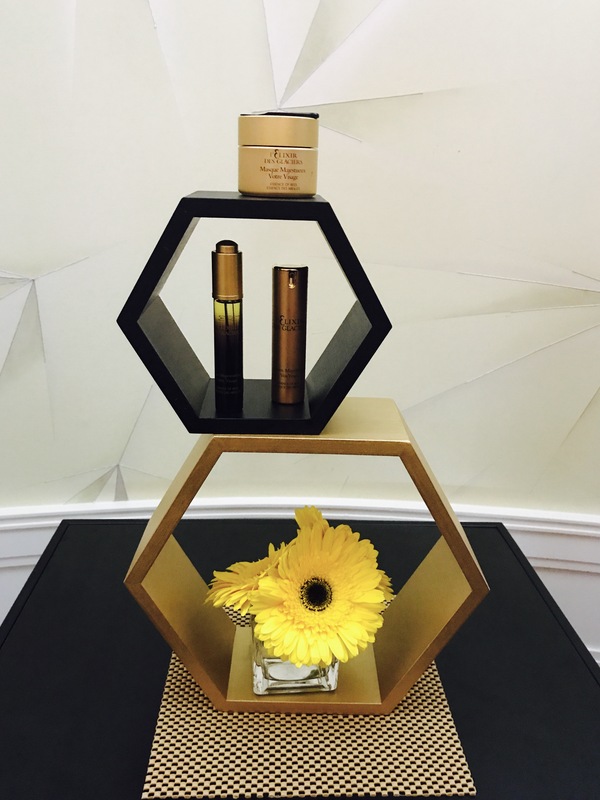 Valmont was at the Hotel Bel Air to unveil their new Essence of Bees beauty line. The three beauty products are made with honey, royal jelly and propolis. We learned that Valmont is partnering with Pollinator Partnership, P2, a non-profit organization dedicated to protecting and promoting bees and their ecosystems. The Swiss company is donating $10 with every purchase of an Essence of Bees skin care product to P2 to support the health of bees in North America. That’s why Hekimian was at the event. He is an expert on bees. Jill Weinlein: How did you become a bee keeper? Paul Hekimian: My father was a beekeeper. After attending a presentation at Whole Foods about bee keeping, my son and I were playing in the backyard and discovered a bee hive. I saved the hive and now have many more. I’m a second generation beekeeper living in Santa Monica. After a few years I became Director of Honeylove.org. It’s one of the many hats I wear. Jill Weinlein: Are there many beekeepers in Los Angeles? Paul Hekimian: Los Angeles and other big cities are the last refuge of the honeybee. Home urban gardens are usually free of pesticides. Southern California and other warm cities offer year-round availability of pollen and nectar. Without bees, California would not have all the flavorful fruit and vegetables. There are nine to 13 bee hives in Los Angeles per square mile. Jill Weinlein: How many bees are in a hive? Paul Hekimian: There are anywhere from 30,000 to 60,000 bees. No matter how warm or cold it is outside, bees keep and maintain the temperature in the hive around 92-92 degrees Fahrenheit. Jill Weinlein: What are some of the benefits of honey? Paul Hekimian: Honey is the only food that does not spoil and can last indefinitely. Bacteria can’t grow in it, because of it’s low moisture content and low pH. Honey is beneficial to people with allergies. A teaspoon of honey that is produced in your community, can help build up your immunity to local allergens. I have a woman in my neighborhood who buys my honey. The antibodies in honey activate certain receptors in her cells to release histamine. Bee pollen is a natural way to reduce histamine, without side effects from over-the-counter medications. Jill Weinlein: How can we attract bees to our yard to pollinate our gardens and fruit trees? Paul Hekimian: To attract bees you should plant bee friendly plants, herbs and trees. They like sage, mint, thyme, lavender, butterfly bush, daisies, honeysuckle, sunflowers, blackberries, raspberries. Pear, peach, apricot, and apple trees attract bees. They also like maples, willows and poplars. Bees hives in an avocado orchard will produce a different essence of honey than bees making a hive in a peach orchard. Paul Hekimian: There are anywhere from 30,000 to 60,000 bees in a hive. Honey bees construct hives by chewing wax until it becomes soft, then bonding large quantities of wax into the cells of a honeycomb. Honey is the complex substance that is a food source for the colony. Jill Weinlein: Why does Valmont use honey in their skin care products? Paul Hekimian: Bees produce beeswax, bee bread, propolis and royal jelly. These offer healing benefits for our skin. Royal jelly is what the queen bee eats an abundance of to help keep her fertile. It helps her lay up to 1,500 eggs a day for up to six years. Royal Jelly is comprised of pollen and chemicals from the glands of young, female worker bees. It contains a rich variety of nutrients, B-family vitamins and 17 different amino acids, including the eight essential amino acids. Propolis or bee glue is a resinous mixture that honey bees produce by gathering pollen. Propolis is known to have anti-bacterial and healing qualities when extracted and placed on skin. Jill Weinlein: Is it true that cell phone towers are killing bees? Paul Hekimian: No. Pesticides in farms, mites and climate changes are killing bees. 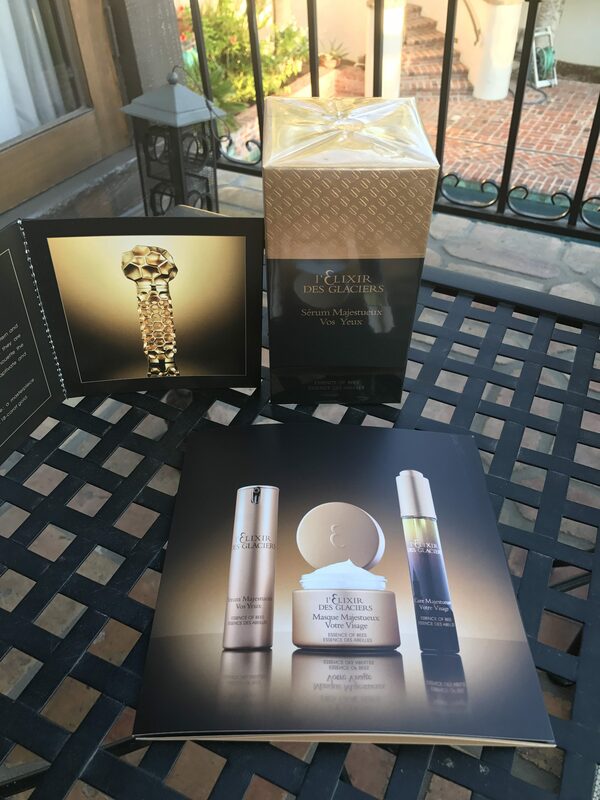 Valmont North America celebrates Essence of Bees facials at The Hotel Bel-Air Spa in Los Angeles, California. The signature butterfly-massage facial helps achieve noticeable anti-aging results. The Spa sells a variety of Valmont Essence of Bees skin care products. 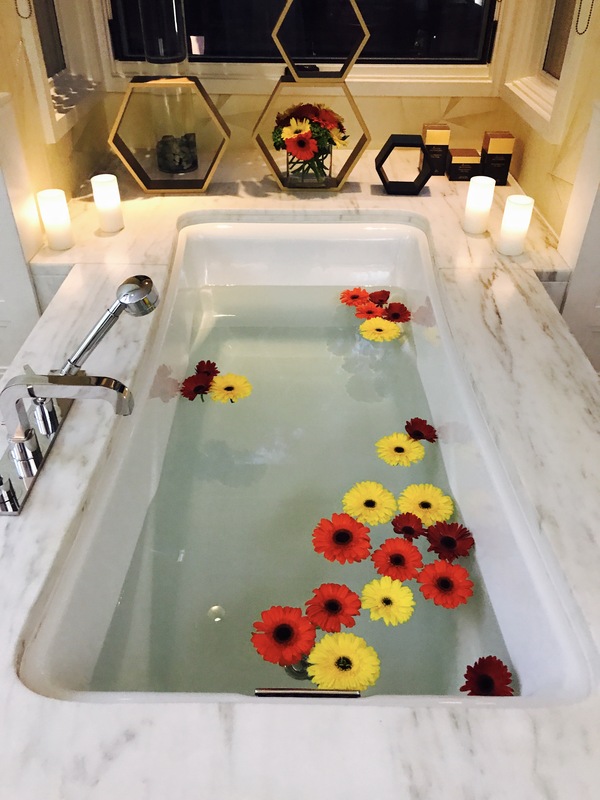 To learn more and help save bees, go to: https://www.dorchestercollection.com/en/los-angeles/hotel-bel-air/spa/ – honey love.org and http://www.essenceofbees.com/en.html.